The project for Indira Gandhi Nahar Pariyojana Canal of Neyveli Lignite Corporation (NLC) Limited, Thermal Power Project at Barsingsar, Rajasthan (2x125 MW). Design, Civil Structures like intake channels, settling tanks, forebay, Raw water intake sump, Raw water pump house, Raw water reservoirs, Hydraulics for Vertical Turbine pumps and Laying, Jointing, Hydro testing and Commissioning of GRP pipeline. Designed to transport 40 cusecs of water, the project Involved construction of pipe bridges across rivers and canals from Sri Pothuluri Veerabrahmendra Swamy Reservoir to Rayalaseema Thermal Power Project (2X500MW) along with construction of a storage reservoir in the plant premises in Cuddapah District Andhra Pradesh. Plant Water System Package (Civil works, Supply, Erection & Commissioning and O&M) comprising of (Geo-technical investigation Engineering, Design, Supply, Construction, Finishing and handing over) of PWPH Building & Intake Tunnels and associated structure with all accessories, PWPH, Cross Country Piping, Pre-treatment Plant, Filtration & DM Water Plant, CIO2 Plant including special tools & tackles on EPC Basis for Kakrapar Atomic Power Project - 3&4. Operation and Maintenance of Chlorine Dioxide (ClO2) & Dematerializing Treatment (DM) Plants for 700 MWE Pressurized Heavy Water Reactor Type Kakrapara Atomic Power Station (KAPS) for 2 years. Activities & services required for preparation of design & fabrication drawings; fabrication, delivery to site and erection/construction of conveyor galleries, trestles, junction towers etc. ; complete drainage system & detailed surveying; geo technical investigation etc. Manufacturing, Supply, Inland Transportation, Insurance, Installation including Civil works, Commissioning & conducting Guarantee Tests of Water Pre-Treatment, Make-up Water System, CW Treatment Plant, Liquid Effluent Treatment Package (Water Treatment System Package) for Vindhyachal Super Thermal Power Project. Raw water pump house with 3 nos of Vertical Raw water pumps along with the associated systems. 2 nos of reactor clarifiers, Aerator, stilling chamber and other ancillary structure of clarifiers. Chemical house comprising of Dozing Chemical storage facility, Dozing solution preparation facility, and dozing facility for the Clarifiers. Clarified water tank with pump house with Horizontal pumps and MS Piping. Manufacturing, Supply, erection, In-plant Transportation, Insurance, Installation including Civil works, Commissioning & conducting Guarantee Tests of Make-up Water System Package for Super Thermal Power Project, Stage - I (3x660 MW) at Sipat, District Bisalpur, Chattisgarh. Instrumentation Works: PLC based Control Panel with Graphical inter phase unit, PC based operator station and peripheral for control, operation and monitoring of make up water pumps, HT/LT incomer, Bus Coupler, Tie Feeder along with all field instrumentation. 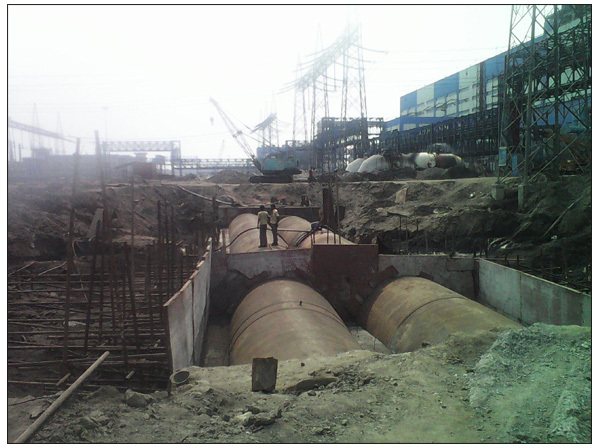 Project : CW Duct replacement package for Singrauli Super Thermal Power Station Stage-I (5x200 MW) for NTPC. The scope of work covered in this portion of the works consisting of all civil, structural and architectural works for providing an Intake Well by sinking in the river Ganges, hydraulic model studies for intake well pump sump, Intake Water Pump House over the intake well, substructure and superstructure of connecting approach Bridge Walkway from the river bank to the intake water pump house, desilting basin, Silt Flushing Pump house, Make-up Water Pump House including Maintenance bay & forebay, Switch Gear building and Control Room including battery room, Transformer foundations, Outfall structure, River Bank protection works, compaction of fill material, roads and drains, boundary wall, culverts and other associated works. The design of all structures alongwith supply of all materials including Cement, Structural steel and Reinforcing steel shall be supplied by the bidder. The work is to be executed on Lumpsum basis. Project : CW & Water System Civil work package from NTPC - Tamilnadu Energy Company Limited Power Project (Vallur Thermal Power Project) (2x500 MW + 1x500MW). Package includes Design, Engineering, Supply, Construction, Erection, Testing & Commissioning works including Civil, Structural and Architectural works for water Pre-treatment Plant, Liquid Effluent Treatment System and Chlorination System.